Upland areas of southeastern United States tidal creek watersheds are popular locations for development, and they form part of the estuarine ecosystem characterized by high economic and ecological value. The primary objective of this work was to define the relationships between coastal development, with its concomitant land use changes and associated increases in nonpoint source pollution loading, and the ecological condition of tidal creek ecosystems including related consequences to human populations and coastal communities. Nineteen tidal creek systems, located along the southeastern US coast from southern North Carolina to southern Georgia, were sampled in the summer, 2005 and 2006. Within each system, creeks were divided into two primary segments based upon tidal zoning—intertidal (i.e., shallow, narrow headwater sections) and subtidal (i.e., deeper and wider sections)—and then watersheds were delineated for each segment. 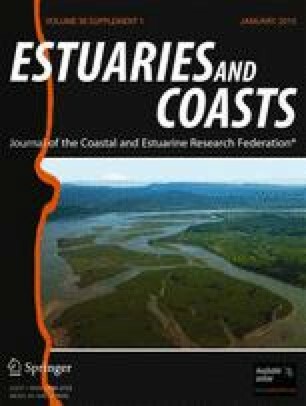 Relationships between coastal development, concomitant land use changes, nonpoint source pollution loading, the ecological condition of tidal creek ecosystems, and the potential impacts to human populations and coastal communities were evaluated. In particular, relationships were identified between the amount of impervious cover (indicator of coastal development) and a range of exposure and response measures including increased chemical contamination of the sediments, increased pathogens in the water, increased nitrate/nitrite levels, increased salinity range, decreased biological productivity of the macrobenthos, alterations to the food web, increased flooding potential, and increased human risk of exposure to pathogens and harmful chemicals. The integrity of tidal creeks, particularly the headwaters or intertidally dominated sections, was impaired by increases in nonpoint source pollution associated with sprawling urbanization (i.e., increases in impervious cover). This finding suggests that these habitats are valuable early warning sentinels of ensuing ecological impacts and potential public health and flooding risk from sprawling coastal development. The results also validate the use of a conceptual model with impervious cover thresholds for tidal creek systems in the southeast region. The breadth of this research project has resulted in a large number of individuals and organizations to thank for their efforts. We are grateful to our National Estuarine Research Reserve partners for field work and support: R. Ellin, J. Fear, P. Murray, and H. Wells (North Carolina) and D. Hurley and B. Sullivan (Sapelo Island). We appreciate the field assistance and laboratory space provided by P. Christian and K. Gates, University of Georgia Marine Extension Office, Brunswick. We wish to thank, for their dedication and hard work, the many individuals who assisted in sample collection: P. Biondo, C. Buzzelli, A. Coghill, A. Colton, C. Cooksey, D. Couillard, S. Drescher, M. Dunlap, J. Felber, R. Garner, A. Hilton, S. Lovelace, E. McDonald, M. Messersmith, S. Mitchell, C. Rathburn, J. Reeves, J. Richardson, A. Rourk, K. Seals, J. Siewicki, and M. Tibbett. We appreciate laboratory work provided by Barry A. Vittor & Associates; the South Carolina Department of Natural Resources–Marine Resources Research Institute (P. Biondo, S. Burns, J. Felber, L. Forbes, A. Rourk); NOAA, NOS, CCEHBR (J. Gregory, C. Johnston, B. Robinson, B. Thompson, L. Webster); NOAA, NOS, Center for Human Health Risk/Hollings Marine Laboratory (D. Liebert, Y. Sapozhnikova, B. Shaddrix, L. Thorsell, M. Beal, A. Mancia, C. Rathburn); and University of Maryland Center for Environmental Science–Chesapeake Biological Laboratory’s Nutrient Analytical Services Lab. We thank the individuals who provided insightful peer reviews of the NOAA Technical Memorandum 82 that this manuscript is modified from: J. Fear, D. Hurley, L. Balthis, G. Lauenstein, R. Van Dolah. And we thank M. Fulton, L. Webster, P. Key, M. DeLorenzo, and two anonymous reviewers for providing comments, enhancing the quality of this manuscript. This project is supported by NOAA’s Oceans and Human Health Initiative and NOAA’s National Centers for Coastal Ocean Science at Hollings Marine Laboratory. Marine Resources Center Contribution No. 698. This publication does not constitute an endorsement of any commercial product or intend to be an opinion beyond scientific or other results obtained by the NOAA. No reference shall be made to NOAA, or this publication furnished by NOAA, to any advertising or sales promotion which would indicate or imply that NOAA recommends or endorses any proprietary product mentioned herein, or which has as its purpose an interest to cause the advertised product to be used or purchased because of this publication. Allen, J., and K. Lu. 2003. Modeling and prediction of future urban growth in the Charleston Region of South Carolina: a GIS-based integrated approach. Conservation Ecology 8(2):2. http://www.consecol.org/vol8/iss2/art2/. USEPA. 2000. Guidance for assessing chemical contaminant data for use in fish advisories, volume 2: risk assessment and fish consumption limits. EPA-823-B-00-008. U.S. Environmental Protection Agency, Office of Water, Washington, DC. 383 pp. Available at: http://www.epa.gov/region6/6pd/qa/qadevtools/mod4references/supplemental/volume2.pdf.